It wasn’t what she said, but the look & smile that sealed our fate. I wasn’t crazy, it was possible. I wasn’t going to stay in Dubai & fight the system again to have a normal, beautiful birth. I was going to travel across the world from the Middle East to New Zealand on 3 airplanes, with CJ not quite 4 years & MC 18 months. It would take over 24 hours in economy class, with luggage & no help….to have a ‘home’ birth far, far away from our home. I was going to do it. Eternally grateful to Kate for that sly smile. I contacted Vanessa in NZ & she put me in touch with Mandy, the homebirth midwife who had supported her through both her pregnancies & births. I felt happy with the recommendation. We arranged with Mum & Dad to stay with them in Raumati for 8 weeks & to birth you there in the downstairs flat where we would stay. This pregnancy I felt I knew my body well enough & chose not to have antenatal care. I was concerned when my pregnancy symptoms dropped dramatically in the 1st trimester so I decided on a 12 week scan. I was traveling to Scotland with CJ & MC for our summer holiday & didn’t fancy miscarrying alone in a foreign country. I am pretty scared of scans after my awful miscarriage experience so I am a nervous wreck going in for them, I cry. All looked well & I got what I needed to see, a lovely strong beating heart. I believed in my body & tried to resist any more medical input but I couldn’t quite trust completely. Around 22 weeks I caved & went for another scan, this time I justified it with the fact we were going to NZ & booked to fly back with a newborn. I wanted to have an idea if there was likely to be any major upsets. Ironically we never did return to the Middle East but that is another story! Again, all looked as it should. 28 weeks, iron test & antibodies with the kiwi GP at Festival City. We arranged for her to write my medical certificate to fly closer to the time. Just before I left I had a wee panic, what if one of us fell sick & couldn’t fly, we’d miss the cut off at 36 weeks, or what if for some reason I didn’t get the medical certificate…..all was well & I had my precious piece of paper. – 36 weeks pregnant, up for 24 hours running with children & luggage through an airport with 2 small kids in tow! What a scene! When we finally arrived in Wellington & there was no one there to greet us I was shattered, when we saw Dad after a bit of searching around I couldn’t hold back the tears & had a cry. We recovered from the trip & got on to NZ time. I met Mandy & started ‘care’. After not seeing anyone through the pregnancy, even these friendly home visits felt bizarre. But Mandy was wonderful, she is very intuitive & she was great with CJ & MC. We all loved her. I had been prepared to birth without A there but once home & with you drawing nearer I realized I really did want your Dad to be there for your birth. He was booked to fly in on Christmas Eve & you were due on the 25th. I asked him to come early so he joined us on the 20th. You felt so close. Each night after my shower I stood naked in front of the mirror. I used my ‘puku nui’ belly oil & massaged my stomach & ‘talked’ to you. Please be safe & strong. We can do this; we are both going to be amazing! I can’t wait to have you with me, earthside! December 27th, dinner time, finally a twinge! Could this be? Quietly excited I didn’t say anything as we finished dinner got the kids to bed etc. A fell asleep & I sat up on my birth ball reading old copies of The Listener. You were coming. I woke up A & told him I thought I was in labour, he sat with me & we timed some contractions, 3 exactly 10 mins apart. He pumped up the pool, I lit a candle then I sent him back to bed. I also climbed back into bed with MC but nope, it wasn’t happening, I couldn’t be comfortable anymore lying down. I got up & started walking. It wasn’t long before I decided I didn’t want to be alone so I woke A up again. About midnight A got Mum & Dad & they joined us downstairs. This labour was so weird, not at all what I was expecting. So textbook I suppose. I spoke to Mandy on the phone to say labour had started & I’d call her later. I paced. I marched. I could not sit down. I did weird things with my hands. I went past the sleeping babes to the toilet a lot. I walked through the lounge & paced the ‘birthing room’. I took A aside & lectured him about not supporting me properly. I was controlled, I was so ready. I had been waiting a long time for this. I asked A to call Mandy to come; as she arrived I started my birth song. Deep & low, like a truck as CJ said. I apologized to Mandy if it was too soon. My labour felt so slow after the intensity of MCs. I actually wasn’t convinced this was the real deal & thought at any moment it could stop & I’d go back to being in my heavily pregnant non laboring state. Mandy slipped into the background & drank tea with Mum & Dad. MC woke up crying, I swore & Mum took her upstairs to play. She calmed straight down & played, one of my biggest concerns was MC & she was fine, yay. Surges were so far apart but good & strong when they came. I had told Mandy I didn’t want any VE’s but I was so confused, & so tempted to ask for one. Why was this going so slow??? It was doing my head in, was I in labour? Was my baby coming? When Mandy would come in the room I would look at her, hoping in my head she would offer to check me. We laughed about it after & she said “I wasn’t going to ask”. Thank-you Mandy. I resisted being touched & instead got in the pool. Massive surges when they came. Oh, I don’t really want to do this anymore I thought. CJ was up now & with us. Dad was filming on & off. Did I want a drink? “No I just want my baby”. Massive, massive surges when they came. This was still too slow, was I in labour, was it going to stop & I’d be pregnant again? Mandy asked if I wanted a squirt of rescue remedy, I did & she wiped my face & arms with a cool flannel, lovely. It was time. I said get Mum & MC NOW! Mandy asked if I could feel you moving down. I couldn’t & then I could, ha, finally I believed this, I was about to birth, you really were coming! I put my hand down a few times to feel for you but I couldn’t feel your head yet. A, MC & CJ were behind me. I screamed your head out. “Is the head out?” I asked. It was, great, I knew the hard work was done & consciously decided to breathe your body out. Next contraction you were born. I looked down & saw you floating to me in the water. A had pushed you through my legs. I will never, ever forget that moment. My baby, my perfect, healthy, strong, safe baby. It was a split second but I felt warm & knew you were fine before I lifted you from the water. What an honor to have birthed you. Hello world! babies are love. Right OK so this is my blog. 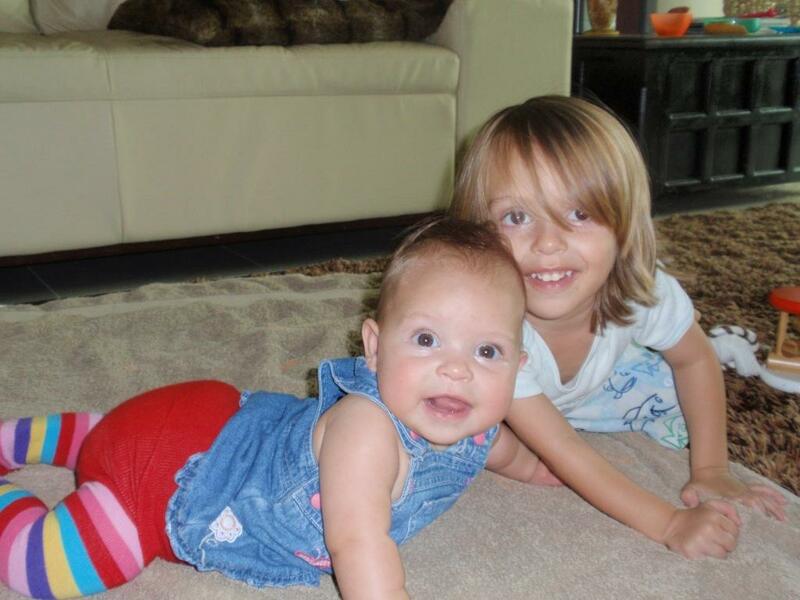 Here is a photo of my babies, CJ almost 3 years old and MC 6 months. CJ was born in Wellington, New Zealand & MC was born here in Abu Dhabi where we live. We (that’s my partner, & I) have been here for almost 2 years. 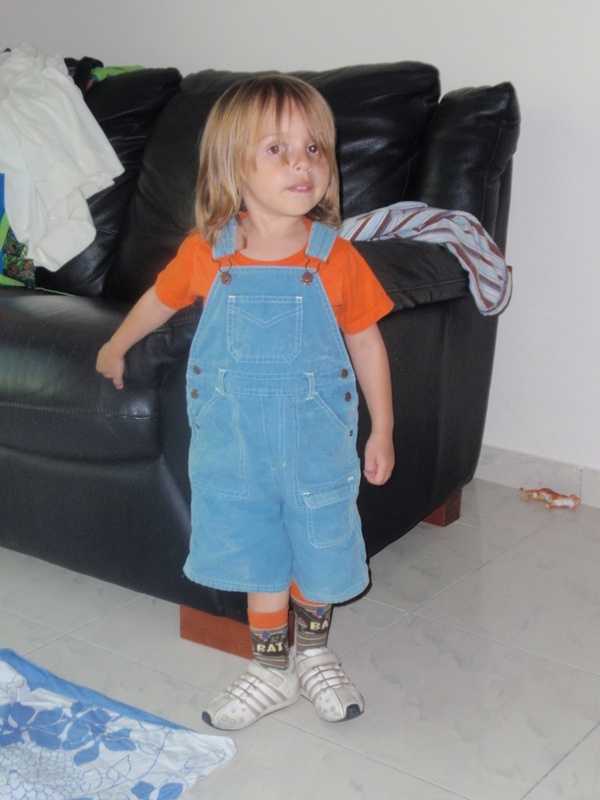 I am Bonnie,happy at home taking care of my babies & enjoying my first expat experience. CJ got through the morning without a meltdown today so I am feeling really pleased. The first day we’ve made progress in a looong time. Here is an extra photo of my baby boy, we’ve been having such a hard time lately & I want things to be right with us. And for him within himself. He is off to get a hair cut tonight.